I took on a project recently that required that I learn a whole load of new techniques and workflow. Given the size of the project, I feel comfortable enough writing about that process and sharing what I've found with others - hence - this article! Read on if you're curious. 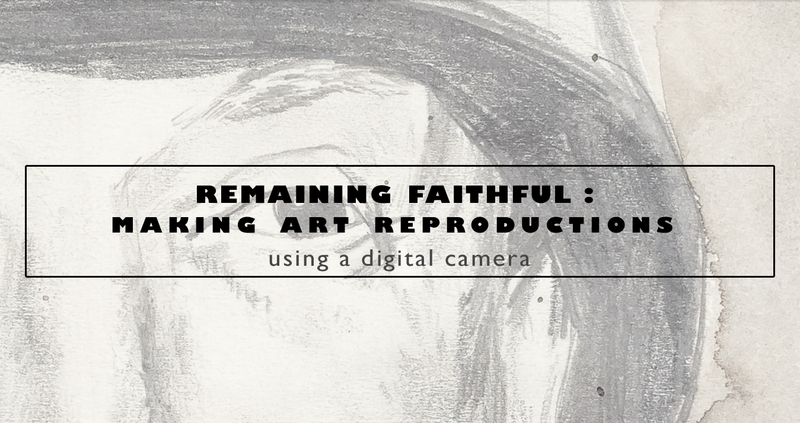 The project: Digitize an artist's entire body of work comprised of sketch books, paintings, loose sheets and more, so every family member can have a copy of every piece of his work. This particular artist is actually my Uncle, and I was honoured to take on this project not only to help his work live on - after all - he was one of my earliest artistic influences. But also for the rest of my aunts and uncles who would love to have copies of their brother's work. It started off a little bit of trial and error. Initially I was working off my flatbed scanner. It has excellent optical quality reaching over 1200dpi or four times life size, but the issue with flatbeds is that they have a relatively shallow depth of field. That is to say that unless the piece of artwork is in contact with all around, then it will have sharper and blurrier bits. Seeing as how some of his work was watercolors with some slightly warped sheets of paper, this just wouldn't suffice for my purposes. And then add on the fact that some of the scans had to made from sketchbooks and coiled art pads, there would be a snowball's chance in hell at getting every sheet lined up perfectly flat, every time. And I try not to settle for anything less than exactly what I am aiming for. Also, most scanners tend to max out at A4, and most art paper is bigger than A4. So I'd either have to make multiple scans of each item and stitch them together - which is a painstaking process. Or I get an A3 scanner, which start at about $800 on the low end. Luckily I didn't have to do either of those. After doing about 6 flatbed scans, I decided I needed a new approach. So i thought back to the only other time I've ever seen or understood how someone accomplished this task - I was doing some freelance photo editing for a magazine, and one of the images to edit was of a Picasso painting photographed beside an X-Rite Color passport. It's a little printed card with maybe 36 blocks of colour on it that allow you to line up the colours of the file to the colours of the colour passport ensuring that they are perfect translations of each other. Thinking back to that photo editing project for that magazine a few years back gave me all the information I needed to get moving in the right direction. Soft, all encompassing light is best. If you have art on a sheet of paper that is darker in one corner than it is in the opposite one - your digital translation of the art is not going to be as accurate as possible. The entire sheet needs to be evenly lit. To achieve even lighting, I had two 1000W halogen work lights in the far corners of the room, and pointed at the white ceiling. This gave an indirect source of light to the artwork and when you light indirectly, it is by nature, very soft, and even because the light is essentially hitting everything else in the room before it hits the artwork itself. When you are indirectly lighting a room, the room becomes your light source. So if you have a blue coloured wall, and a red coloured ceiling, (ok thats an ugly freakin' room, but just to illustrate a point) the light that comes from the red ceiling will leave a red cast on the art, and the light from blue walls will leave a contrasting colour cast on the art. This doesn't help your colour accuracy. My studio is basically all white, maybe a little bit of beige in the walls, but the important thing is it's uniform. On a flatbed scanner, you get to choose your DPI, which you can think of as "how closely the scanner is looking at the art". I don't get to choose that on a camera. The DPI of the finished artwork is indirectly a by-product of a few things: the megapixels of the camera sensor and the size of the artwork within the frame. So in order to get the highest DPI possible from your camera, you want the piece of art to fill the biggest portion of the frame possible. You should try and have two parallel edges of the paper touching two corresponding sides of your viewfinder. 300dpi is considered life size, as most printers top out at 300dpi. It doesn't matter how much you go over 300 but you definitely should avoid going lower. 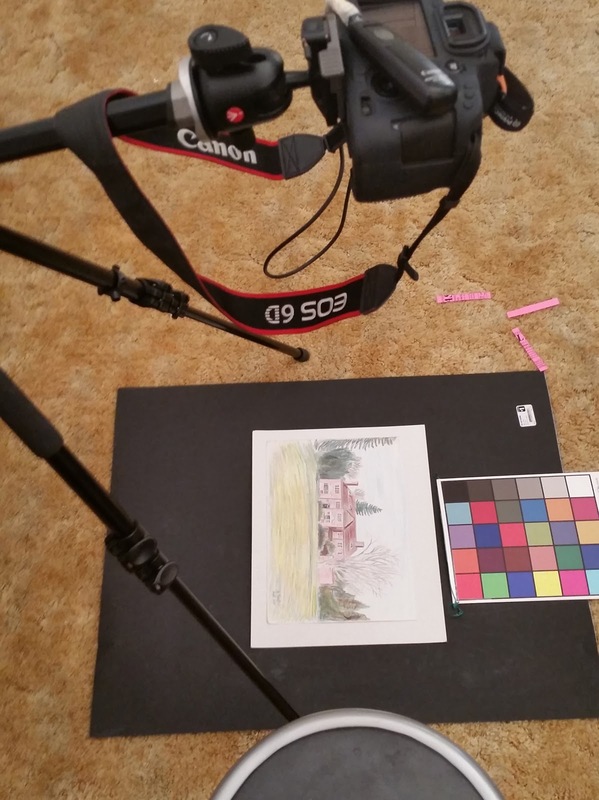 To calculate your DPI from a photo reproduction, crop the frame to match the page size. Look at your file's cropped resolution; lets say in the case of one sheet of paper, that was 9"x12" I had 3230x4270px. That means my effective dpi is 356 which is more than 300 so I am happy. If I was shooting on a 7 megapixel camera instead of a 20 megapixel one, then a photo taken with exactly the same settings would be insufficient for reproduction. This is why I thought about renting a Canon 5DSr for this task, or whatever the canon model is with the 50 megapixel sensor. But I didn't. The 6D held up perfectly. The lens choice is as important as the camera. You want to shoot with a normal focal length. In my case, I used a 50mm prime. For a few reasons ; a prime lens is sharper than your average zoom lens. Sharpness is key of course for retaining subtle details. Also important is understanding distortions. If I was using even a 35mm lens which is still considered a 'normal focal length', you start to get a little bit of distortion - meaning straight lines get bends in them. This is not acceptable for art reproduction. You could correct the bend/warp in post processing, but you shouldn't have to do that, so I avoided it. Because all lens have even slight amounts of distortion increasing toward the outward edges of a frame, its best to keep the centre of your artwork in the centre of the camera's frame. Another form of distortion that you will be susceptible to is 'perspective distortion'. So its important that the piece of art remains parallel to the focal plane. So the easy way to describe it; if your sheet of paper is laid flat on the floor we can call that 0 degrees of tilt to the horizon. So the camera's sensor needs to be oriented in that exact same way. I have a manfrotto tripod that allows the centre column to come out and instead of travelling vertically up and down the tripod, I can use it horizontally too. So that means I can have a stable tripod base, and then have a camera pointing straight out at 90 degrees to the height of the tripod. (Check the image I've attached). So I mentioned I was using halogen work lights. Halogen are not perfectly white lights, but they sure are bright. The perfect companion to shooting with a colour passport is to shoot in RAW. So you retain all the original camera info about the colour of the light falling on the artwork. So even though halogen aren't perfectly coloured, I had my workaround for that. If you had a light meter that can measure colour temperature, you could simply take a reading, and set your camera's "K" value to match, and would be able to shoot in JPEG for saving file space, but that wasn't of huge importance to me - and I don't have a light meter. Exposure settings are important. The entire motivation for shooting this way was so that I could have an increased depth of field for added sharpness when the paper wasn't completely flat. So I shot at f/11. If you've ever shot at f/11 indoors, you'll know you need a pretty decently long shutter speed. This is why the halogen work lights are handy. at 1000W each, they send out a whole lot of light, which means faster photos. And the faster the photo, the less chance you have of inducing vibrations to the camera setup that will induce blurriness. Also, imperative, on the topic of shutter speeds, even with all that hot halogen light kicking around the room, the exposures were still nearly a whole half of a second. In photo terms that is a very long, slow photo. If I was firing the camera by hand for every shot, I'd need the ten second timer to help dissipate the vibrations that would be introduced by my hitting the shutter button - instead I countered this with a wired shutter release. So I never have to actually touch the camera. Lastly before any photo is ready to be taken, consider where your focus lies. I kept my focus on auto because some books were thicker than others, so if the first page of a book, the focus is locked at 1 inch above the floor surface, by the time I am on the last page, that focus point is going to be off by one whole inch. Sounds like not much, but its huge. I kept autofocus on the whole time. And I am typically a 'centre point only' kind of guy, but for this occasion, I turned all the focus points on. In theory they should all find the same 'plane' its just some pages of sketches didn't have the contrast necessary for the auto focus to lock on in the centre point alone. This is one of those times when I use the histogram to set my exposure to the right settings. What you want to do, is take an empty sheet of paper, and photograph it, then read the histogram. The large spike closest to the right hand side of the histogram is where your white point lies. To get the widest gamut of colour, you should have your 'white spike' as far to the right hand side as you can, without actually touching the edge. This guarantees that you don't 'clip' any of the data out of the capture. Lastly, in the photo below, you'll notice I am shooting on a black piece of bristol board - although its not necessary, it was useful in that it helps make easy definition of the paper's edge to aid in cropping once the files are on the computer - helpful - but not entirely necessary. Go ahead, if you've followed all the steps above, shoot a photo now - you're ready! I wound up with 600 RAW files of my uncle Tony's work. The next and last remaining process is to trim every image to exactly the size of the paper it's on, apply the colour correction which I measured with my colour passport, and then export as JPEGs for everyone to have their copy of. This was quite an interesting project for me, so if you have a similar project that you need the help of a professional to accomplish - please keep me in mind!